If Orson Scott Card's Ender's Game is the reason I became hooked on science fiction, Anne McCaffrey is the sole reason I began to read fantasy. I owe everything to her and the series that begins with Dragonflight. While first published in 1968, Dragonflight did not make it into my hands until I was in eighth grade (maybe 1998 or so). For my English class, my teacher required us all to read a book from a different genre than what we liked. At the time, I was a huge fan of Mary Higgins Clark and that was all I was reading. So, my teacher suggested I try a fantasy novel. 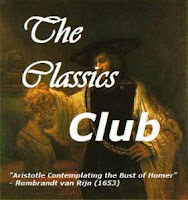 My best friend Jenny was also in the class, so we both searched the fantasy shelves trying to find an interesting book. We decided then and there that we needed to find a book that our school library had two copies of, so we could read it together. We ended up finding our book. The book of choice was The White Dragon by Anne McCaffrey. We didn't realize at the time we checked them out that The White Dragon was the third in a series. But that didn't matter. We both read it and fell in love. Arguably, I loved it more than she did. My love of fantasy was born. I ended up convincing my mom to take me to the book store so I could buy the first two books. Then I bought more, and more, and more. My collection of the "Pern" novels grew. I was obsessed. To this day, I still find it funny that I was hooked on fantasy by a series that began in the 60s and is still going today. It was an odd choice for a young teenage girl, but I don't regret it. And as I have read more and more fantasy as I have grown older, I have learned that the Dragonriders of Pern is one of the best fantasy series ever written. It was inventive, new, and inspiring. It is truly epic fantasy. McCaffrey is the mastermind behind much of dragon based fantasy today. Her series was one of the first big series that centered on dragons. Books like Eragon have McCaffrey to think for blazing the trail. It also helped jump start my own love for dragons (no, really, I love me some dragons). If you want to see where dragon based fantasy began, you have to read this series. There are a few other titles that have come out since, but all are with collaboration with Todd McCaffrey, her son. I have not read any of those, but only those she has written. I read this one way back in 1997 and loved it...she's the reason why I started reading fantasy too!!!! I was first introduced to these as a teen, too. 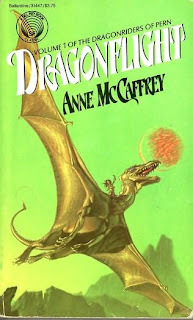 I had never heard of Anne McCaffrey but a friend gave me Dragonflight as a birthday present- and after that I read about half the series. My favorites were always the Harper Hall books. 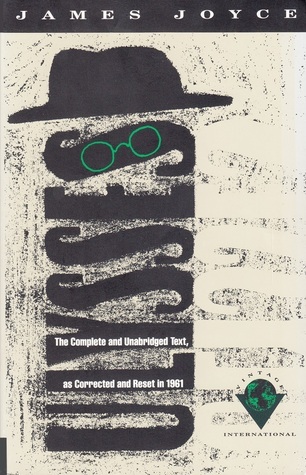 I haven't read any of the newer ones, either.